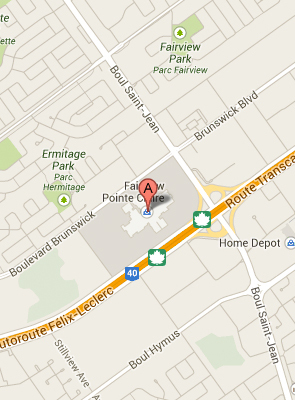 We are conveniently located 20 minutes from downtown Montreal, on the West Island. Follow Highway 20 West to the St. John’s Road North exit. Follow St. John’s Road to the Trans Canada (highway 40). Take the exit for highway 40 West (on your right) and follow the service road (past the underpass) to enter the Fairview Shopping Center (on your right). Or if taking the Trans Canada, follow the Trans Canada, (highway 40) WEST to the St. John’s Road exit, stay on the service road past the underpass. The Fairview Shopping Center is on your right. Follow Provincial Highway 40 (the Trans Canada) East to the St. John’s Road exit. Turn left on St. John’s and stay to the right. Immediately take the exit for highway 40 East (on your right) and follow the service road (past the underpass) to enter the Fairview Shopping Center (on your right). Follow Highway 15 North to the Champlain Bridge, cross the Bridge and stay on Highway 20 Ouest (West). Take the St. John’s Road North exit. Follow St. John’s Road to the Trans Canada (highway 40). Take the exit for highway 40 West (on your right) and follow the service road to enter the Fairview Shopping Center (on your right). Follow Highway 40 East to the St. John’s Road exit, stay on the service road past the underpass. The Fairview Shopping Center is on your right. NOTE - We make every effort to respond to all emails within 24-48 hours. For an immediate response, please feel free to call us directly, any day of the week, during our opening hours.